Nearly 500 walkers have started a 100 mile (160 km) trek through Powys as part of an annual challenge set by a walking association. Participants will walk through the day and night in an attempt to complete the route within 48 hours. They set off from Llandrindod Wells on Saturday morning, heading for surrounding towns and villages. 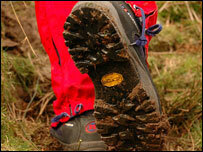 Organised by the Long Distance Walkers' Association, it is the first time the event has been staged in Powys. It is in its 31st year, and sees walkers trekking through the villages of Aberedw, Glascwm, New Radnor, Dolfor, Llangunllo, Felindre, and the Elan Valley. Janet Pitt-Lewis, chair of the Marches long distance walking group, said she was delighted the walk was being held in mid Wales this year. "It is the first time this event has been held in Powys, so we are very excited," she said. Tonia Parry, tourism development officer with Powys Council, said the authority had been working with organisers for the past 18 months on plans. "An event like this is not only a boost to the local economy, but is a great opportunity to showcase the area as an excellent place to visit," she said.